Preparation – Being over-prepared will do wonders for your nerves on the big day. Research the company, Google the interviewer, and find out as much as you can about the department you’re applying to. Not only will knowing all of this right off the bat make you sound like an intelligent and motivated candidate, but it will give you opportunities to ask questions of your own and show genuine interest in the company. Ace your resume – There’s no reason why you shouldn’t know your resume inside and out (even if you had someone else write it). That piece of paper is oftentimes the only bit of info your interviewer will have about you, so expect questions to be based directly off your resume, and be prepared to expand upon your relevant achievements. Body language – What you say with your body during an interview is almost as important as what’s coming out of your mouth. Sit straight, lean forward, smile, and make eye contact. Don’t slouch, fold your arms, look down, fart, or fidget. You may not like how superficial our society is, but appearance is crucial. Be animated and articulate – Don’t sound like a robot when asked “tell me about yourself” or “why do you want to work for X company.” Answering too quickly, monotonously, or with one long “uuuhhhh” will make you sound either too rehearsed, uninterested, or simply unprepared. Make an effort to be clear and confident so you sound like you’ve put thought into your answers. Follow-up – Always send a thank you note to your interviewer for their time and consideration within 48 hours of the interview. This isn’t just good manners: a follow-up note gives you the chance to reiterate your interest and ask any questions that weren’t answered during the actual interview. Your resume has been perfected. Your cover letters off the chain. You’ve networked like a champion and cleaned up your online profile. The results? You’ve scored an interview! Not really, but it is important. The is it's always the interview—not the resume, not the contact, not the cover letter, not even your 3.99 GPA—that will make or break the job offer. So there is nothing more important than nailing it. Everything from body language to body odor can alter the outcome. But don’t worry—a little preparation, practice, and grooming can go a long way. The best advice we can give, particularly for newcomers to the job market, is to accept every interview you’re offered. Even if you are 99% sure you will not want the job, interviewing is an acquired skill, and any chance to practice will pay off down the line. When you are in the war room, follow these tips to make sure you’re putting your best foot forward. Research the company, the industry, and the interviewer beforehand for interview rockstardom. Start with the company website; pay close attention to major divisions of the organization, highlighted products or services, recent achievements, vocabulary, and who’s who. Search Vault for company profiles, employee surveys, diversity statistics, and more. Find out if they’ve been in the news lately through Lexis Nexis or by searching the archives of major papers like The New York Times, The Wall Street Journal, or The Washington Post. Learning about the interviewer through the company website and a Google search will let you cater your questions and answers more effectively. Just as you will research the company, industry, and interviewer prior to the interview, odds are they will also look into your background. First place they’ll start: Google. So, be sure to clean up your online identity before pursuing the interview process. Try to set up interviews with companies/industries that are similar to your dream job for more practice. Most industries have pretty similar interview questions and formats, so it’s good to be familiar with these ahead of time to avoid being surprised on the big day. Some college career centers off mock interviews to alumni, so check in to see if your school can help you prepare. Talk to any friends or associates who have either interviewed with the company in the past or are currently working there to get the inside scoop on tricky questions. Elementary school aside, interviewers will indeed judge a book by its cover. Showing up in wrinkled khakis and a stained shirt will get you blacklisted faster than a liberal federal prosecutor. Make sure clothes are clean and pressed a few days in advance. Lay them out the night before the interview so that the morning stress isn’t augmented by having to tear apart the closet in search of a brown belt. Find out the general dress code for the company (ask the person who set up the interview). If the dress code is unstated, be conservative. Make sure hair is neat, nails are clean, make-up is not overdone, and breath has that Mentos freshness. See more on dressing dos and don’ts. Know the resume inside and out. It is often all an interviewer has in front of him, so use it to anticipate questions. Be comfortable talking about all background aspects, such as academics, professional experience, and interests. The interviewer may ask for real-life examples of dealing with co-workers, leading a team, or overcoming failure. Come armed with a number of personal and business anecdotes that paint a picture of an exceedingly qualified applicant. Re-read the job posting before going in and be sure to tailor your answers to the needs of the position. A few days before the meeting, conduct a mock interview using sample questions and answers and a friend, video camera, or mirror. The more Q&A now, the less qualms and anxiety later. Don’t participate in insider trading, but do be obnoxiously organized. Bring at least five resume copies, printed on good quality paper. Have reference lists, work samples, and any other papers a potential employer may want to see or that you’d need to fill out an application. Store all documents in a folder so that they remain unsullied and unwrinkled. Plan travel far in advance; this is not the time to try a new short cut or explore an unfamiliar area. Make a practice run if necessary and leave time for traffic, forgetting something, or getting lost. Shoot to arrive ten minutes early so there’ll be time to gain composure, and eat a meal that won't upset your stomach or make you act insane (i.e., no liquid Red Bull lunch). Even if the talking goes well, the interview can be sabotaged by body language blunders. Upon first meeting, give a firm, sincere handshake as opposed to a limp and sweaty dead fish. If the interviewer does not offer an invitation to sit, do not ask for one but just choose a chair across from or next to the desk. Avoid soft lounge chairs and couches, which make for awkward positioning and difficult rising. Maintain eye contact but avoid long stares and keep a smiling, calm face (just not in a weird, creepy way). Hands should be kept folded on the lap, not crossed at the chest. Leaning back or looking down reflect a lack of confidence; show earnestness by leaning forward and using expressive gestures. Keep a relaxed and balanced posture. Pay attention to the interviewer’s body language, as well. Nodding signifies approval and leaning in shows interest. That said, you might get a stone-cold HR robot, so don't let a lack of expression throw you off. Folded arms, crossed legs ,and picking make-believe lint from clothing are signs of boredom. Fidgeting, like finger drumming, thumb twiddling, and nail biting, indicate inattentiveness. Check out this link to learn more on body language laws. This is not the time for a Micro Machine man impression; speak slowly and clearly. Research has shown that mirroring the behavior of others makes them comfortable, so match the rate of speaking to that of the interviewer. Take a slight pause before answering to make the response sound less rehearsed. Answering too quickly may signal that we have not taken the time to assess the problem before offering a solution. Avoid negative comments about past employers—disgruntled in the past reads as whiner in the future. When baffled by a question don’t resort to “um” and “uh,” but buy time by paraphrasing or restating the question or asking for clarification. Tie responses into the company’s mission. When asked for a weakness, find a negative quality that can be expressed in a positive light (but try to avoid the "I'm a bit of a perfectionist" line—it's been done before). Also, try to never answer questions in a yes or no fashion. For example, to the question: “Are you a hard worker?” Don’t just say yes. Instead, give a tailored response that highlights something in your resume that reflects your work ethic. Since this is your first gig, you probably won’t be asked any technical questions. If you are, it is always best to say that you don’t have the relevant experience but you think you are more than capable of getting it given your previous experience in [fill in the blank]. For further preparation, view The University of Pennsylvania interviewing guide, paying particularly close attention to the “Types of Questions” section. Near the close of the meeting, the interviewee is often asked if he or she has any questions. This is an opportunity to show interest. Take a look at good questions to ask and have a mental list prepared. Use that research to prepare some questions beforehand that are specifically tailored to the company and the interviewer. Current events, a new product line, and programs for new hires are all good topics to broach to show that you’ve done your homework. Do not inquire about salary, benefits, or vacation time—all sound self-seeking. Let those topics be brought up by the interviewer or ask someone in HR at a later stage in the process. Phone interviews are often a critical first hurdle in landing an in-person interview, and in today's world of "tele-commuting," they might be the only interview you get. Since eye contact and body language are absent, what is said and how it is said is very important. Use enthusiasm and intonation to sell. Avoid gum chewing, smoking, or eating and minimize background distractions such as yapping dogs, flushing toilets, or clanking dishes. If possible, call or receive the call from a land line so that it doesn’t become a Cingular dropped call commercial or a “can you hear me now?” snafu. Think of a phone interview as an open book test—have notes and resume at hand. For more phone fundamentals, see About.com’s Phone Interview Tips article. Interviewers tend to give certain clues when the meeting is nearing the end. Taking off his/her watch, putting the resume away or moving it to another part of the desk, changing posture or position to indicate he/she’s about to get up, asking “Is there anything else?” or saying “Get the hell out of my office” are all hints that things should come to a close. Ask for a business card, give a firm handshake along with a thank you, and express interest in hearing from them in the near future. A follow-up thank you letter is not only polite, it's also a chance to reiterate qualifications, reemphasize a desire for the position, or bring something up that didn’t get mentioned in person. 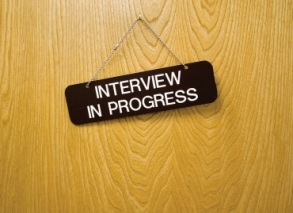 Write a brief note to each individual who took part in the interview within 24-48 hours. Look over some sample thank you letters to get started. If there is any doubt over correct names, spelling, or titles, call the office to double check (you don't have to give your name). If a week goes by without hearing from them, make a call. It’s very important to know the company’s dress code, if you’re going to an interview. So that you wouldn’t worry on what dress you would go to wear during the interview. On the other hand, private universities can more or less decide their own policies, which attract negative attention at times, such as dress code policy, and a recent stink began over the Morehouse College dress code. The Morehouse College dress code forbids a man to wear anything resembling women's clothing – although one wonders how it's a problem. The Morehouse College dress code isn't much of a scandal – it's just requiring students to take their appearance seriously.